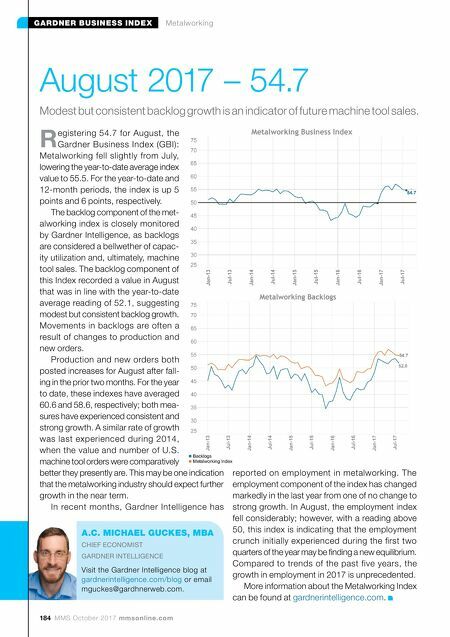 184 MMS October 2017 mmsonline.com GARDNER BUSINESS INDEX Metalworking August 2017 – 54.7 A.C. MICHAEL GUCKES, MBA CHIEF ECONOMIST GARDNER INTELLIGENCE Visit the Gardner Intelligence blog at gardnerintelligence.com/blog or email mguckes@gardhnerweb.com. Modest but consistent backlog growth is an indicator of future machine tool sales. R egistering 54.7 for August, the Gardner Business Index (GBI): Metalworking fell slightly from July, lowering the year-to-date average index value to 55.5. For the year-to-date and 12-month periods, the index is up 5 points and 6 points, respectively. The backlog component of the met- alworking index is closely monitored by Gardner Intelligence, as backlogs are considered a bellwether of capac- ity utilization and, ultimately, machine tool sales. The backlog component of this Index recorded a value in August that was in line with the year-to-date average reading of 52.1, suggesting modest but consistent backlog growth. Movements in backlogs are often a result of changes to production and new orders. Production and new orders both posted increases for August after fall- ing in the prior two months. For the year to date, these indexes have averaged 60.6 and 58.6, respectively; both mea- sures have experienced consistent and strong growth. A similar rate of growth was last experienced during 2014, when the value and number of U.S. machine tool orders were comparatively better they presently are. 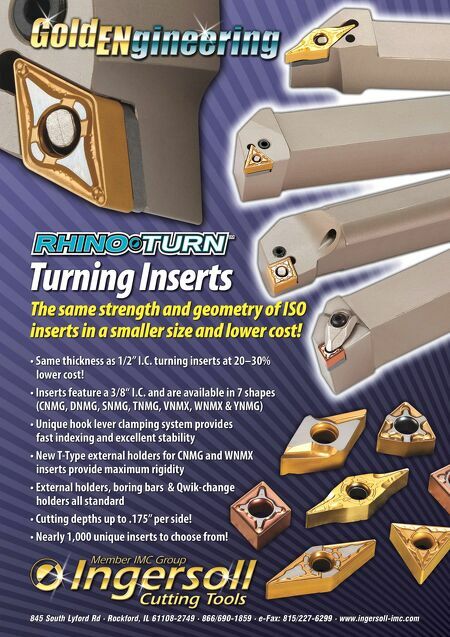 This may be one indication that the metalworking industry should expect further growth in the near term. In recent months, Gardner Intelligence has reported on employment in metalworking. The employment component of the index has changed markedly in the last year from one of no change to strong growth. In August, the employment index fell considerably; however, with a reading above 50, this index is indicating that the employment crunch initially experienced during the first two quarters of the year may be finding a new equilibrium. Compared to trends of the past five years, the growth in employment in 2017 is unprecedented. More information about the Metalworking Index can be found at gardnerintelligence.com .